A box contains 5 pieces. 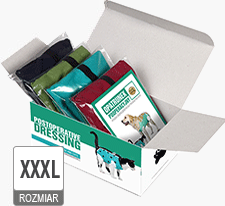 suitable for middle-size cats or dogs like yorkshire terrier, pekingese, chinese crested dog. suitable for miniature schnauzer, french bulldog, pug, shih tzu. suitable for pointer, sighthound, golden retriever, irish setter, dobermann, boxer. 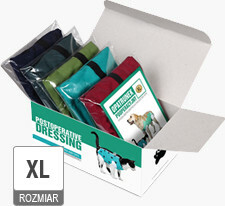 suitable for german shepherd, labrador, giant schnauzer, bernese mountain dog. A box contains 4 pieces. 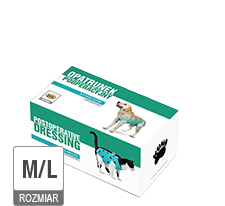 suitable for st. bernard, alaskan malamute, newfoundland. 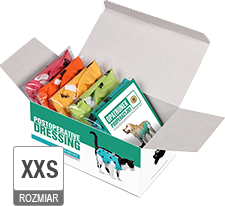 Dressings are sold in boxes containing 5 pieces (or 4 for size XXXL). Colors in sizes XL, XXL, XXXL may vary slightly from those shown in the pictures. If You are interested in a custom amount of dressing - please, go directly to the order form.